Homeowners Sarah and Chris Hines wanted their Norwell, Massachusetts, home to be a reflection of the things that they and their kids, Olivia, 12, and Cole, 10, like to do. 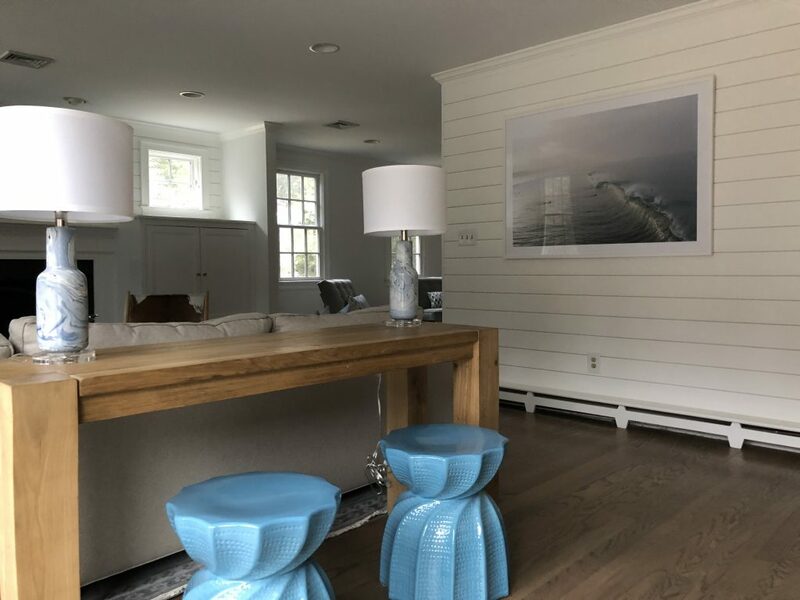 “They surf, they’re out on their boat, they cycle—they’re an active, free-spirited family,” says designer Maggie Jerde of Maggie Jerde Design in Norwell, who was the designer for the project along with her partner, Jamie Therrien. 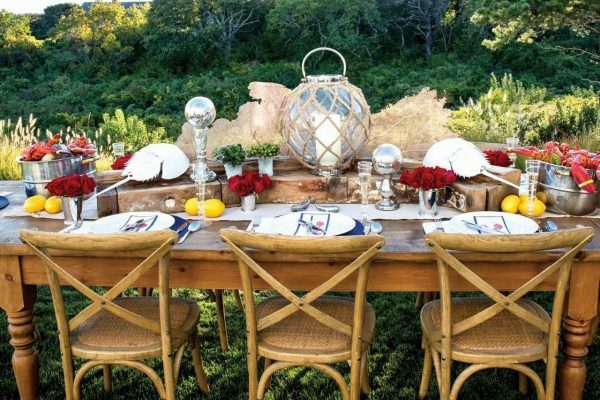 Situated next to Jacob’s Farm, the home, built in 1999, has an old-farmhouse feeling. 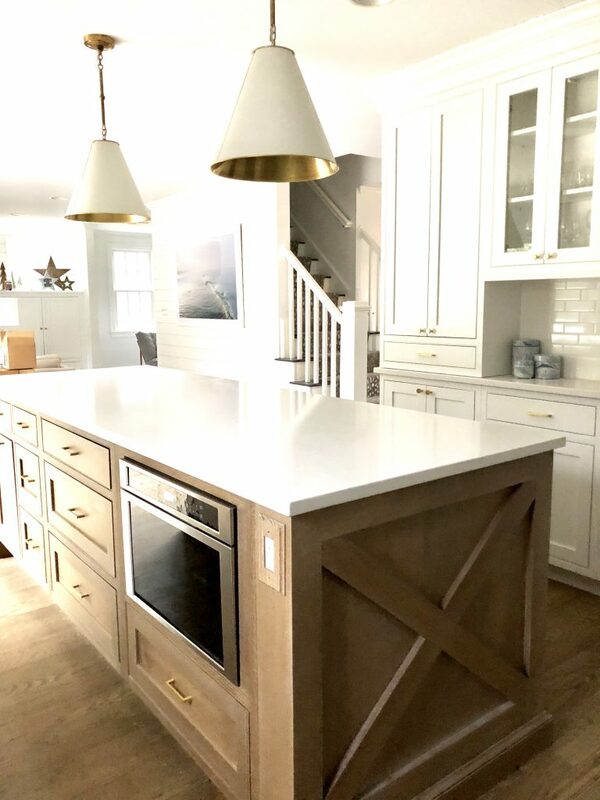 In the interior design update, Jerde says the Hineses wanted to incorporate modern design elements while paying tribute to the home’s original style. The white ultramodern handmade porcelain subway tiles with a crackle finish reach all the way to the ceiling. “On each side of the sink, we put floating shelves for the everyday ‘china’,” says Jerde. Pictured is blue-swirled “Strata” dinnerware from Anthropologie. The oak kitchen island has a cerused finish that highlights the natural grain of the wood. “When I started the project, the first thing that hit me was the staircase,” says Jerde. “It’s right in the middle of the house, but the rest of the house is an open floor plan. I needed to treat these stairs special, otherwise they’re an intrusion.” Jerde says they decided to wrap the stairs in white shiplap. 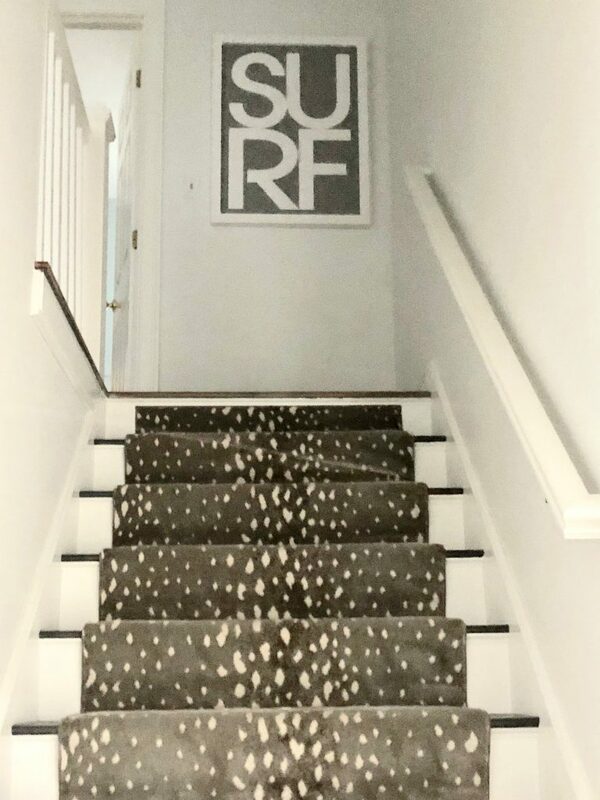 “It made quite a difference to the whole house.” The staircase boasts an antelope-print runner, and hanging on the wall at the top of the stairs is a complementing art piece reading SURF, from Bodega Nantucket. “The powder room had existing bead board,” says Jerde. 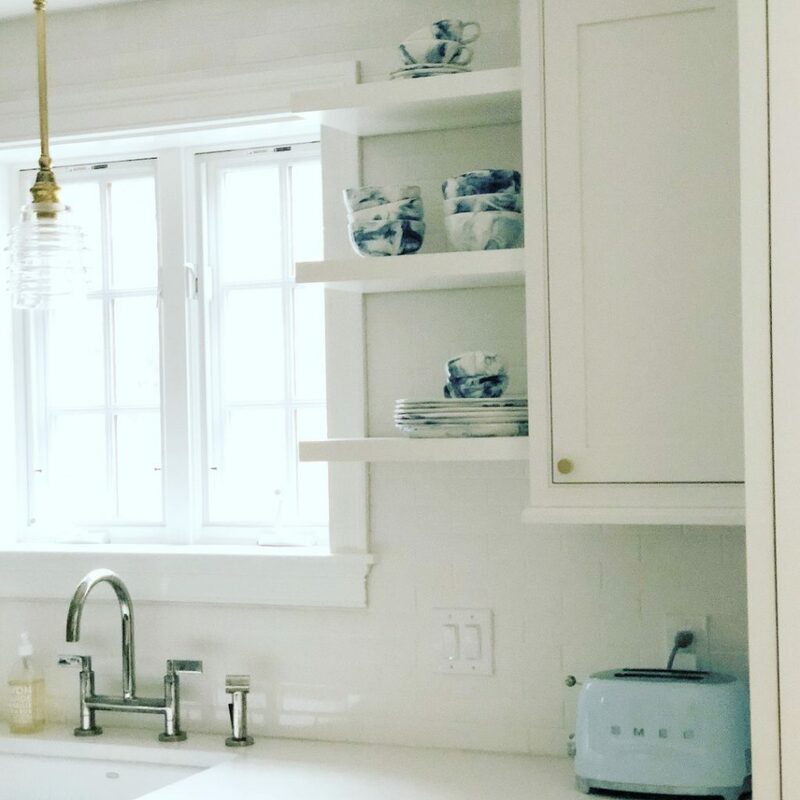 “I knew I wanted to walk the line between farmhouse and modern, so we made the walls white but painted the bead board a mushroom color,” she says. The floors are a hydrangea blue-purple penny tile, which is a typical farmhouse style, says Jerde. 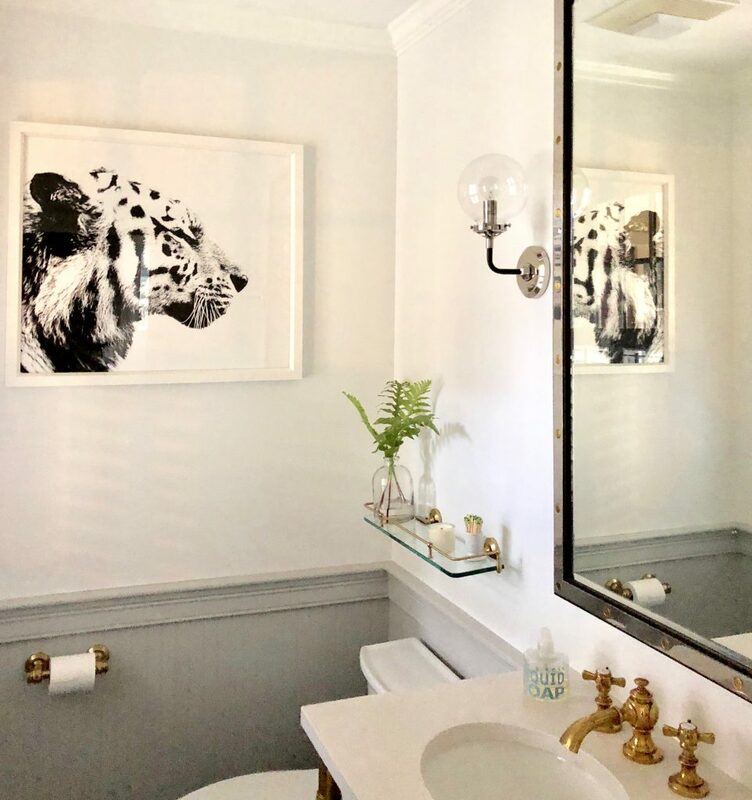 The tiger print adds an unexpected accent. Even the mudroom sports modern elements. The floor has black-and-white tiles whose pattern is similar to that in the kitchen backsplash. “You see both patterns at the same time, and we didn’t want them to compete,” says Jerde. 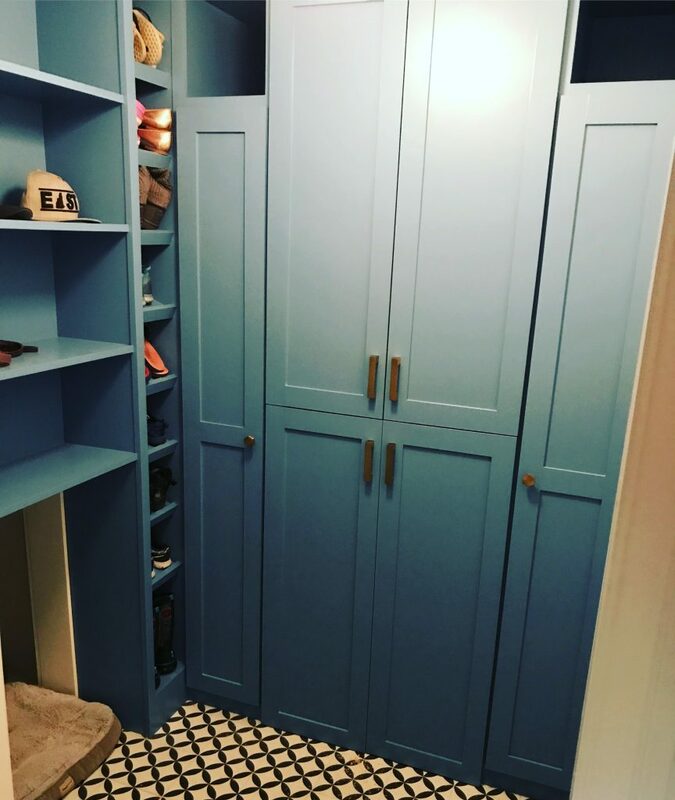 The vibrant blue cabinets have brass hardware, and a ceiling fixture brings out the different shades of blue. In keeping with the color scheme, more muted blues and grays distinguish the family room. 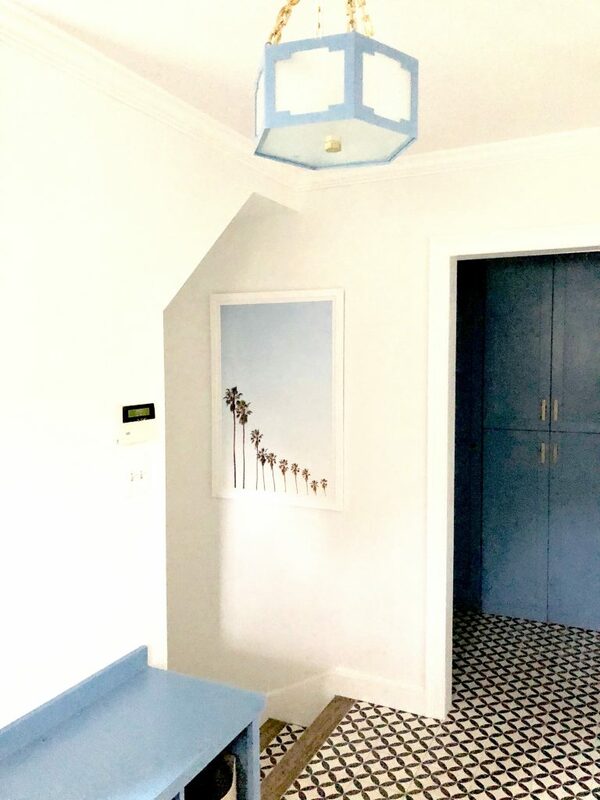 Striking blue ceramic stools from Shop Candelabra add a splash of color in the console area between the kitchen and the family room. “We needed to keep that space open yet we wanted a design element there,” says Jerde. 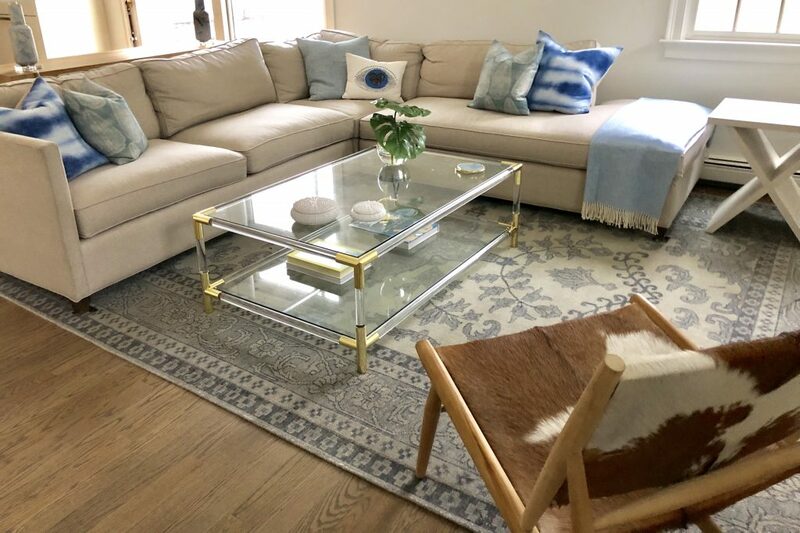 For the family room, Jerde chose an oriental rug from Caitlin Wilson and paired it with a lucite-and-brass coffee table from Jayson Home. Throw pillows on the couch are by Susan Connor and Rebecca Atwood, both based in Brooklyn.